Poster presentation at the Lithuanian Neuroscience Association's 9th Annual Meeting, December 1, 2017, Kaunas, Lithuania. Click to expand the poster. Background and aim: The organization of the brain and how it implements the mind has yet to be understood from a broader perspective. Psychologists Tomasello, Kahneman and Tversky, neuroscientists Damasio, Graziano, Panksepp, and others have contributed new insights. We describe the human mind as a system of cognitive frameworks, and we consider how aspects of the functional organization of the brain may have evolved to implement such a mind. Materials and methods: We organize a diagram of the components of the brain in terms of their functions, as given by the textbook Brain Function and Its Origins, Schneider, 2014, and encyclopedic sources. We compare these functions with a system of cognitive frameworks by which the mind M = S1 S2 interacts with the world W and balances what we intuitively know (S1 = Kahneman's System 1) with what we consciously don't know (S2 = System 2). 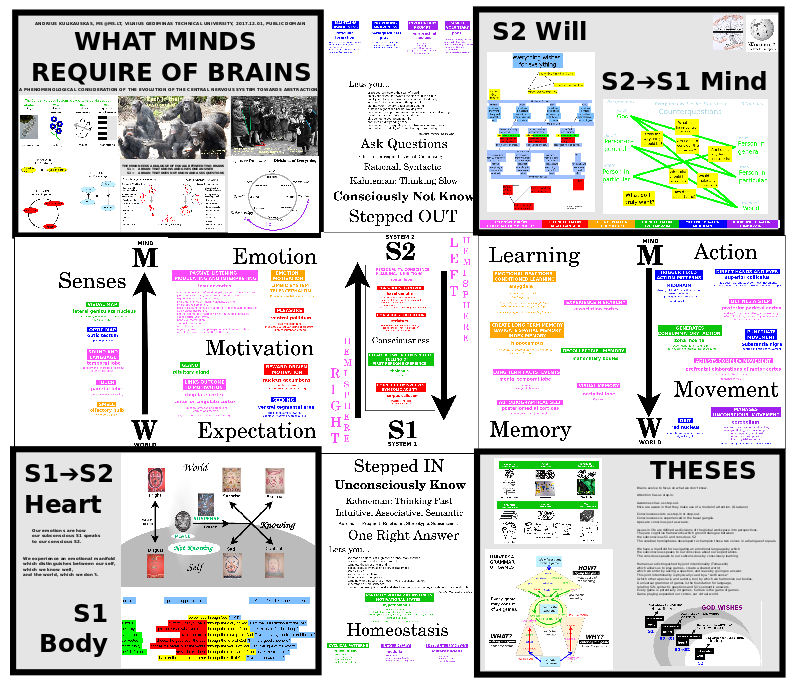 We assign the brain's components to six major categories: Senses (W=>M) and Movement/Action (M=>W), Homeostasis (S1) and Consciousness (S2), Learning/Memories (S2=>S1) and Emotion/Motivation (S1=>S2). Results: We note the evolution of the central nervous system by which the world is modeled increasingly abstractly in terms of icons, then indexes, and ultimately by symbols in the neocortex. The symbolic mind divides the global workspace into perspectives. The will arises in logically balancing S1 and S2, which may typically be championed by right and left hemispheres. This balancing occurs in the basal ganglia of apes. Humans are distinguished by playing games with semantic (S1) and syntactic (S2) obligations, namely, answering every question. Flexible creation of these shared worlds expanded the cerebral cortex. Conclusions: The requirements of a mind can be variously implemented by the brain. The brain may be thought of as relating advocates for distinct cognitive frameworks. Right and left hemispheres may champion S1 and S2.